Mopping is the most common way to clean tile floors. This method can be effective and works well for day to day cleaning. The best natural way to clean your tile floors is with very hot water and vinegar. Vinegar is a good organic grease cutter. However there are draw backs to only using a wet mop and cleaner on tiled floors. Mopping does not do a very good job of removing the grease and oils that are embedded in the pores of the tile and the grout. 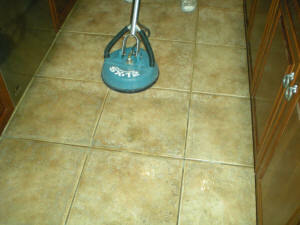 The grout will also absorb the dirt and grease from the water used to mop your tile floors. In order to improve the look of your tile floors you could resort to scrubbing the tile and grout on your hands and knees or use a messy pressure washer. To clean your grout, let some full-strength white distilled vinegar sit on it for a few minutes and then scrubbing it with an old toothbrush. While both methods do a better job of cleaning tile and grout than mopping, they are not very effective. Scrubbing your tile and grout can further embed the dirt and oils into the pores of the tile and grout lines. The overspray from pressure washing to remove the dirt and grease can make an incredible mess on your walls and cabinets. Another method you could use to clean your tile floors is a "Vapor Steam Cleaner". While a vapor steam cleaner does a better job of cleaning your tile and grout than just scrubbing, there are a few disadvantages. 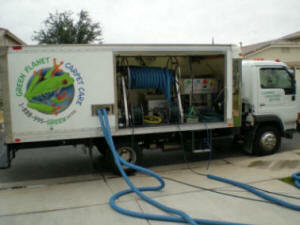 The price of the vapor steam cleaners are between $450.00 and $2,800.00, the average homeowner unit costs about $900.00. Another disadvantage is the pressure is typically only about 75 psi and the units have no dirty water recovery vacuum system. The homeowner steam cleaners are also labor intensive. An average kitchen, approximately 200 square feet of tile and grout, will take about three to four hours to clean. Besides using the steam cleaner, you will still need to scrub stubborn stains, and continually mop up the dirty water. These cleaning methods are not very appealing since they are messy and labor intensive, but there is a better way! Turbo Pressure Washing To The Rescue! We use a pressure washing system designed specifically for ceramic tile cleaning & grout cleaning, acrylic, and epoxy surfaces. To find out more about how Green Planet Carpet Care can make short work of this tedious task please refer to out "Tile Floor Cleaning and Grout Cleaning Service" page.